Gently sways and idles about. This pet is only purchasable from Nat Pagle at a level 3 Fishing Shack. Players must have the Good Friends reputation with Nat Pagle in order to buy the Land Shark. Slaps the enemy with its tail, dealing 433 Aquatic damage. If you do not have Good Friends Rep with Nat Pagal you cannot use this pet. However, you can buy it from Auction House, but cannot learn the pet until you increase your rep.
Focus will increase Blood in the Water's hit chance to 75% which makes it useful because it will increase your speed, hit, and crit for the other attacks you pick to spam. Or just make a bleed team. Shrugg, Im pretty sure its already a big advantage to have it before 6.1, since taht means anyone waiting will have to fish for 100 lunkers as they will add sea calf, rather than you who only needs another 50. Patch 6.1 changes: "Lunkers can now be caught from fishing pools and have an improved catch rate with higher fishing skill." can anyone suggest a good lunker fishing spot? or was it just random places, I seem to be able to get lunkers just north of the garrison, was just wondering if anyone had found a really good drop area. Neat looking pet, but abilities looks like junk and having a bad breed. Focus + blood in the water is NOT a reliable attack! Finnaly done with my fishing the hell out of Draenor for this pet. -Which also resulting in me getting the Lil' Leftovers by making around 2400 Feast of Waters of the fish. Anyway, the pet is HUGE! I mean it's literally more than half my hight (human). As a battle pet, it is among the best aquatic pets at dealing high burst damage. Focus (+25% bonus for crit, speed and hit) followed by Blood in the water (having then a total of 75% hit) will output great damage. Especially when it critically hits. 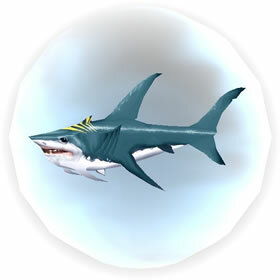 I am looking forward to getting this pet, as my wife is a shark fan. I hope they dont miss out on giving it Rip, or Huge, Sharp Teeth in the attack line up. It would make a hard earned pet ,as this one, well worth playing and useing in battles. After birth, newborn sharks quickly flee their hungry mothers. Their early independence makes them dangerous, even while young.